Beautifully designed, solid construction, easy dial based control system. May be slightly too small for larger families - check the dimensions prior to buying. 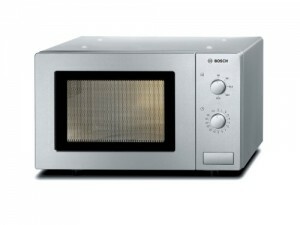 The Bosch HMT72M450 is a freestanding 17 litre solo microwave, with a stylish stainless steel silver finish. The control system is remarkably easy to operate - simply select the power level on one dial, and set the timer on the other, going up to a maximum of 800w and 60 minutes respectively. In terms of overall size, this solo microwave from Bosch is pretty small - however it still manages to fit a 24.5cm removable glass turntable, which should accommodate most plate sizes. Overall capacity is a relatively modest 17 litres, and 5 different power levels are included, from a basic 90w up to high at 800w. The interior light is pretty good, making the microwave interior easy to view when in use - and the small overall size of this microwave means it will fit in most small spaces in your kitchen. In use, it worked very well, cooking fast and with no cold or unheated spots during our test period. 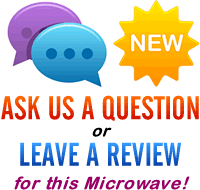 Our three testers all unanimously loved this microwave - granted it may be too small for larger households, but for the average kitchen or work place it will be ideal. If you're looking to buy a relatively cheap and reliable solo microwave, then the Bosch HMT72M450 ticks the boxes - it looks stunning, works well, and offers very good value. Our test team highly recommend this microwave. 24.5cm Diameter glass turntable - removable for easy cleaning. Can be installed under a wall unit - check overall dimensions to make sure it fits your kitchen.